Most famous for his roles as Apollo Creed in the Rocky films and as Dillon in Predator, Carl Weathers had a moment in the 1980s. He even starred in his own action film that was so filled with action it had action in the title. That would be Action Jackson for those not in the know. Weathers was muscular and handsome. Really, his appearance was almost unreal. In his day, he looked something like a black Ken doll; which, I think, invites some closer consideration. He had the right look of an action star but he was the wrong color for the time. For the most part, black actors were sidekicks in action films, they were part of a duo as in the many buddy cop films of the 80s. Or, if they did star in their own action films, it was made evident that they weren't real action stars. Eddie Murphy's role in Beverly Hills Cop was more comedic than tough, thereby preserving the norm of the white action hero. It wasn't until the early 90s that black actors such as Wesley Snipes and, to some extent, Samuel L. Jackson got to carry an action film. Now, of course, Will Smith's action movies make millions, but again, there is the humor aspect that changes the whole tone of his image. But to return to Weathers-- in the 80s, he never played a stereotype and was always a good guy (in his role as Creed, he went from being Rocky's opponent to being a friend)-- playing either boxers, cops or military men. Yet he was never able to be in the league of the major action stars of the day. He just didn't catch on. It could be argued that some action stars just didn't reach the pinnacle that others did. Certainly, Chuck Norris or Dolph Lundgren, who are famous in their own right, aren't in the same category as Sylvester Stallone or Arnold Schwarzenegger. 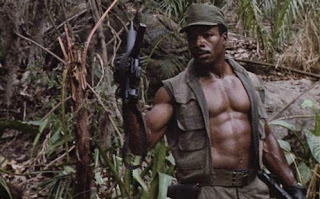 Maybe the same set of circumstances kept Carl Weathers out of the top tier of action stars. Except he wasn't in the same set of circumstances. He starred in two of the blockbuster hits of the 80s. (Lundgren did play the villain Ivan Drago in Rocky V but that is precisely why I think his situation is different than Carl Weathers. Few action stars of this era rose to the top playing villains. The only actor who did that was Arnold Schwarzenegger with James Cameron's Terminator. However, it must be acknowledged that Schwarzenegger promptly reversed that performance by playing the reconditioned and no longer villainous terminator in Terminator II). What likely kept Carl Weathers out of the mainstream was an unease surrounding black masculinity. It also didn't help that Action Jackson wasn't a very good film. In some ways, he made a career out of a stereotypical idea of blackness, in that black men are often considered only in terms of their bodies, their physicality. Yet he made a point of subverting that by playing stereotypically white roles- that of brave soldiers and cops. Though Weathers got his start playing criminals and thugs in blaxploitation films of the 70s (Bucktown and Friday Foster) he avoided those types of roles later in his career.